Morning everyone! Over at Studio Calico we are gearing up for next's month release, but I'm still having fun with all the goodies from last month:) Last month, I was lucky enough to have my first designs come out in the Card Main kit and as a standalone stamp/die set, Buttercup! 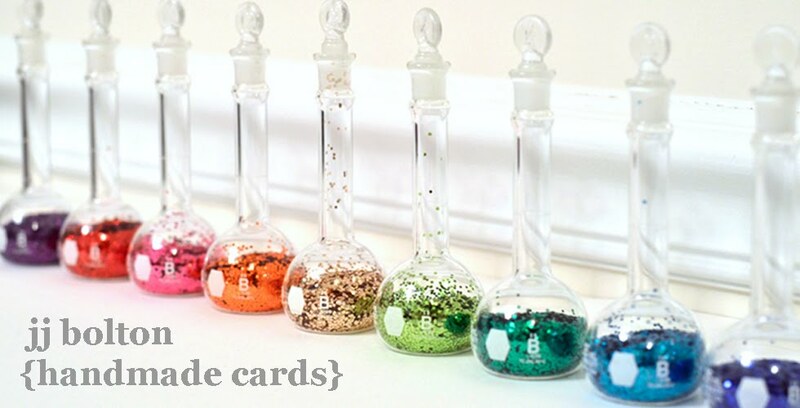 For the card kit, I designed oversized sequin dies and that kit is still available! My Buttercup set is out of stock at the moment, but I'm told that they have reordered a new batch. As you can see, I fussy cut the sentiment. Definitely not a new technique, but I love how it looks! To add a little shine, I die cut several metallic gold triangles and glued them into the die cut background here and there. I'll choose a winner on Friday night at midnight EST and announce on the blog on Saturday, April 19th. This is such a cool card! I love the bits of gold! Oh... such amazing colors on this beautiful card! Love the touches of gold! Beautiful card. Your handwriting is gorgeous!! You should definitely design some sentiment stamps!! Such pretty colors in watercolor topped off with the triangle die. The gold adds so much. Love it! I follow your blog on Feedly to make sure I catch each blog post. Love the soft watercolour look. So pretty! I love the watercolor background peeking out from behind. Gorgeous card! Wonderful, wonderful card, JJ! That texture, and the pops of gold.. perfection! Beautiful card, looks so wonderful!!! great card-loving the watercolor look too! I'd love to be entered...this is such an awesome card. I first saw it over at SC member gallery and I was thinking to myself...how can I recreate this? GORGEOUS card! LOVE the little pops of gold - such a perfect mix with watercolors! Thanks for a chance to win! And I follow on Google Connect! This is so cute! I don't make cards but this one make me want to try. I love the gold bits best. I follow you using the friend connect thing on the sidebar and on bloglovin. I just discovered your blog and started following you! Your work is fantastic! Oohhhh is that your handwriting?? I've been looking for a watercolor set for a while now - love your new designs! Wow! This is gorgeous! I love the gold triangles throughout! So happy to already be a blog follower and thank you! Love, love, love this the card and the use of watercolor. Fabulous card! Love the watercoloring and the triangles. I'm so happy to have discovered your work and your blog through CT work at Studio Calico! :) I'll be waiting for your stamp set to come back into stock. I missed it trying to grab another add-on at reveal. Thanks for the chance. And following your blog through Blog Lovin'. And following you now on Twitter. :) Thanks for the chances. Your card is so gorgeous, those colors are so striking, love the background!! I am so excited because I follow your blog through email updates!! I love how simple but awesome it is! Another die I just HAVE to HAVE! LOL! I love the beautiful colors - your trademark JJ! And of course that little bit of gold! This card is beautiful! Absolutely love the background. I love that pop of gold. Would love to win! It looks amazing! I follow your blog also! Love the colors on your card. great card! thanks for the giveaway! Beautiful card...I'm fond of watercolors and am currently in pastel rainbow mode. This card really catches my eye. I recently started following your blog...signed up for an email feed via feedburner....and spent a long time backing up through previous posts. Great stuff. Love your card! Thanks for sharing and for the giveaway! I Follow you now on google. This is glorious. The touch of gold is perfection. Love the watercolor effect! tfs!!! Beautiful card, love the little bits of gold here and there. I love the watercolor behind the die cut triangles. The fussy cut sentiment is perfect. I follow you on goggle. Gorgeous card! 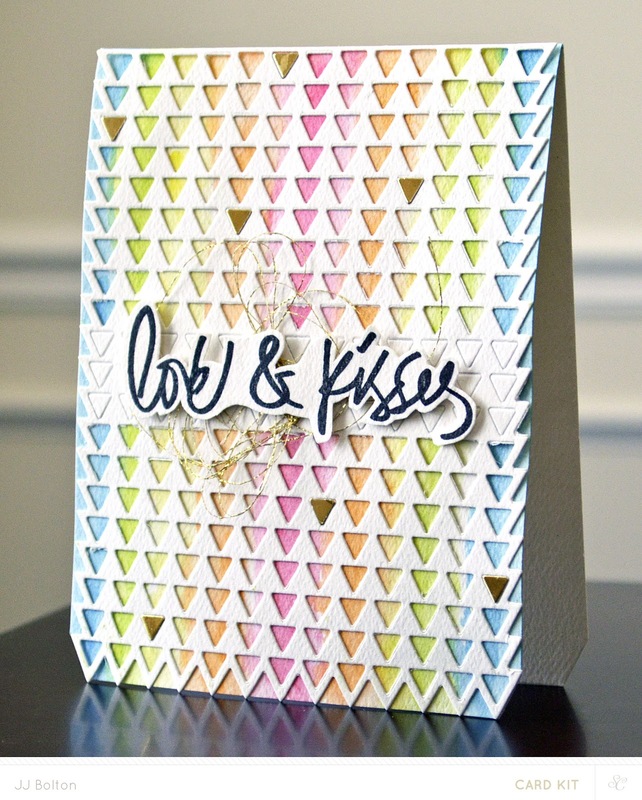 I love the watercolor background under that fabulous triangles die! What a fun trendy-in a good way-card. I would love to win the water colors and try this trend myself. Love this card, JJ! Great idea putting gold triangles here and there! I'm already a follower, thru email and on Bloglovin! What a gorgeous card JJ! As always!! I already follow on Feedly!! I am already a Twitter follower!!! I adore this card! The gold little accent triangles are perfection! Seriously awesome! I do hope they restock Buttercup--love your handwriting! love buttercup. your card is awesome. thanks for the chance to win. Amazing card! I adore the sherbet watercolor background and all those tiny triangles. Your watercolour card is lovely as are those Studio Calico watercolour paints! And, I follow your blog via Bloglovin. Awesome card! Thanks for a chance! I follow by email :) Always get your updates first and right in my mail box so I don't miss a thing. Beautiful card. Especially love the random gold accent triangles! Awesome card, love the additional gold triangles added. What a fabulous card! Love the gold pieces you put in. I follow you on Twitter and just tweeted. What a great card! Love the background, and your fussy cutting...I would have swore it was a die! I love your card, I would have sworn the fussy cutting was a die. Love the card and the watercolor look! Your card is beautiful! Thanks for the chance to win too! Love how you made the background for this card! I follow your blog via email! You are such a talented crafter! Thank you for sharing your beautiful cards with us! Waaaiit a minute, YOU are the genius behind the sequin dies that I spent all morning trying to track down only to find that they are only available in the SC kit?!? Oh my word, how did I not know this?! You are seriously awesome. And of course I follow you, naturally. I have you delivered right to my inbox! I am a follower of your blog. I am in love with this look. This die is so pretty with the gold accents. I see wedding/anniversary cards too! Ok, so I don't use twitter. I guess this will count as a comment anyway. This card is adorable. I must try it! I love this card, the colors are so much fun!!! LOVE the stuff you do!!! Follow you via Google.. Thanks. 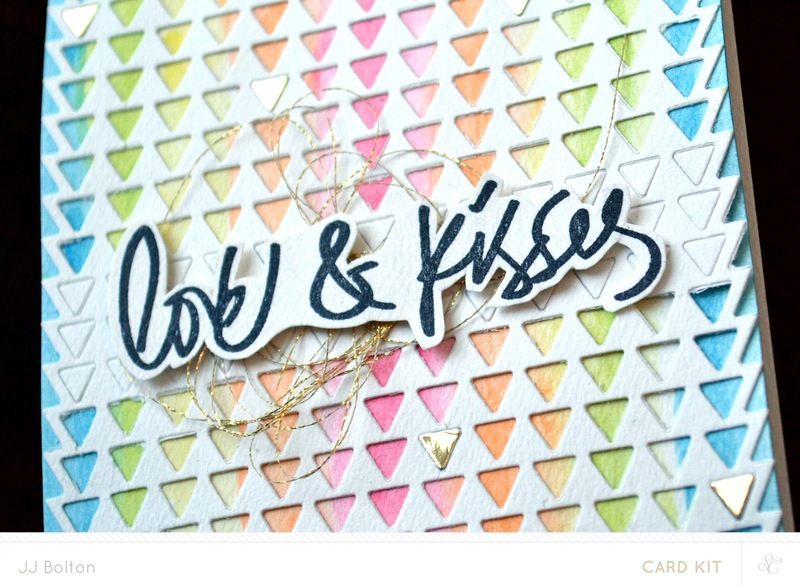 Love your card...the colors and those gold triangles are perfect. I love all the inspiration I get from you and other members of Studio Calico. I already followed you your cards are always full of inspiration this card is also great. Thanks for the chance to win. I'm a twitter follower too! Thanks for so many chance to enter. Love this card, JJ! Such a clever way to play with your water colors and dies, and your fussy cut sentiment is fabulous! It''s so much fun to visit your blog ~ Thanks so much for the tip about using water colors...and for always sharing your beautiful designs with us! What a beautiful card! I love the touches of gold you added with the thread and tiny triangles. Wow those soft watercolours look amazing under the die! I follow your blog through google. Do not have a Twitter account. Thanks for the chance to win this generous giveaway! Beautiful card! I love the background die & those little gold accents! Stunning card! Love the watercoloring behind the awesome triangle die. AMAZING card with a big WOW factor, love love love!! !